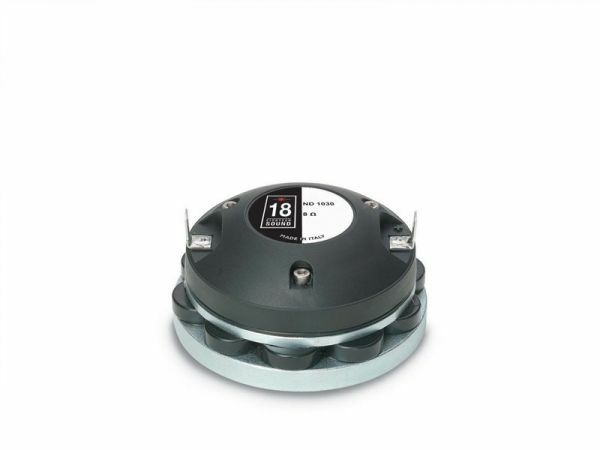 Produktinformationen "18s ND1030 8 Ohm"
The ND1030 1-inch exit high frequency compression driver has been designed for use in high quality two-way audio systems. The ND1030 exhibits a constant slope response from 1.5kHz to 18kHz with a uniform and smooth roll-off. With a 900Hz free air resonance frequency, the ND1030 can easily be cut-off at 1800Hz and is capable of 60W continuous power handling with a 1800Hz pink-noise signal, and a 6dB crest factor with a minimum 12dB/oct crossover slope. Equipped with unique Phase Plug architecture, the ND1030 has been designed to give a smooth coherent wavefront at the horn entrance in the whole working frequency range, as well as high level manufacturing consistency. The phase plug design with its short openings and high flare rate value assures low distortion and demonstrates remarkable improvements in mid-high frequency reproduction. The ND1030 titanium diaphragm assembly, with its ellipsoidal suspension shape, exhibits a constant slope response from 1kHz to 18kHz with uniform smooth roll-off behavior. An edge-wound aluminum voice coil, wound on proprietary treated Nomex, completes the diaphragm assembly. Nomex shows a 30% higher value of tensile elongation at a working operative temperature (200°C) when compared to Kapton. This feature enables proper energy transfer control from the voice coil to the dome in real working conditions. Moreover, this proprietary former material is also suitable for use in higher moisture content environments. By careful use of elementary pieces of neodymium magnets, Eighteen Sound engineers have developed a powerful neodymium magnet assembly capable of reaching 18KGauss in the gap within a compact and lightweight structure. Weiterführende Links zu "18s ND1030 8 Ohm"
Kundenbewertungen für "18s ND1030 8 Ohm"